ARLINGTON, VA; AUGUST 16, 2012— PBS celebrates Hispanic Heritage Month 2012 with a lineup of programming that entertains, informs and explores the culture of Hispanic and Latino Americans. With subjects ranging from mariachi music to masked wrestlers, from visionary architects to poets, these special programs provide fascinating insights into the lives of generations of Hispanic Americans who have enriched our nation and society. PBS’ celebration of Hispanic Heritage Month extends beyond the broadcast and onto pbs.org. The PBS video player — where viewers can watch hours of free PBS programming online and on their own time — will feature a special collection of new and PBS archive programs honoring Latino culture. VOCES ON PBS, a showcase of outstanding documentaries that celebrate the rich diversity of Latino life, premieres Fridays, September 28-October 19 at 10:00-11:00 p.m. ET. VOCES kicks off with “Tales of Masked Men” (September 28), an absorbing insider’s look at the world of Mexican “lucha libre,” famous for its masked wrestlers, followed by “Escaramuza: Riding From the Heart” (October 5), about a gutsy team of women rodeo riders vying to represent the U.S. at the National Charro Championships in Mexico. “Unfinished Spaces” (October 12) tells the story of the Cuban Revolution through its most significant work of architecture, Cuba’s National Schools of Art, and the three visionary men who designed it, while “Lemon” (October 19) follows Puerto Rican poet/performer Lemon Andersen, a three-time felon and one-time Tony Award winner, as he struggles to take his life story to the New York stage while battling his darkest demons. Other new programs includePOV’s “El Velador (The Night Watchman),” a mesmerizing film about a security guard who watches over the extravagant mausoleums of some of Mexico’s most notorious drug lords. Directed by Natalia Almada, the film premieres on Thursday, September 27, 10:00-11:00 p.m. ET. New programs are joined by a strong lineup of encore programming. PBS ARTS presents JOHN LEGUIZAMO’S TALES FROM A GHETTO KLOWN, a profile of the actor/playwright and his unorthodox rise to success, and MARIACHI HIGH, an inspiring year in the life of a group of high school students who have devoted heart and soul to their music. Other highlights include powerful documentaries such asNOT IN OUR TOWN: LIGHT IN THE DARKNESS, a look at the residents of a Long Island town who take action after a local immigrant is killed in an attack by seven teenagers. PBS programs have recently been recognized with three Imagen Awards, for “honoring positive portrayals of Latinos and Latino culture in entertainment." Awards were given toFRONTLINE's "Lost In Detention" for Best National Informational Program, GREAT PERFORMANCES' "Il Postino From LA Opera" for Best Variety or Reality Show and the PBS KIDS GO! series NOAH COMPRENDE for Best Web Series: Comedy. POV “El Velador (The Night Watchman)” Thursday, September 27, 10:00-11:00 p.m. ET(check local listings) Award-winning director Natalia Almada (POV “Al Otro Lado,” 2005; POV “El General,” 2009) returns with a mesmerizing new film. From dusk to dawn, “El Velador (The Night Watchman)” accompanies Martin, a guard who watches over the extravagant mausoleums of some of Mexico’s most notorious drug lords. In the labyrinth of the cemetery, this film about violence without violence reminds us that, amid the turmoil of a drug war that has claimed more than 50,000 lives, ordinary existence persists in Mexico and quietly defies the dead. VOCES ON PBS Fridays, September 28 -19, 2012, 10:00-11:00 p.m. ET (check local listings) Celebrate the rich diversity of Latino life in this showcase of outstanding documentaries. “Tales of Masked Men” Friday, September 28, 2012, 10:00-11:00 p.m. 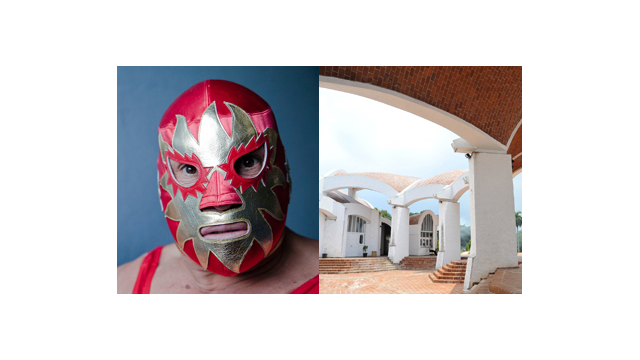 ET(check local listings) From the director of the acclaimed “Foto-Novelas,” “Tales of Masked Men” explores the fascinating, mysterious world of lucha libre and its role in Latino communities in the United States, Mexico and Latin America. Famous for its masked wrestlers and called by one aficionado “a sport in the key of melodrama,” lucha libre is part circus, part athletic contest, part theater. The sport inspires passionate loyalty while contributing a lasting cultural idiom to America’s pop culture landscape. “Escaramuza: Riding From The Heart” Friday, October 5, 2012, 10:00-11:00 p.m. ET(check local listings) Las Azaleas are a gutsy team of women rodeo riders vying to represent the U.S. at the National Charro Championships in Mexico — where “to be Charro is to be Mexican.” Escaramuza, or skirmish, describes both the daredevil horseback ballets, ridden sidesaddle at top speed, and the intensity of the competition season. Neither life-altering challenges at home nor cartel violence across the border can keep Las Azaleas from their goal. “Unfinished Spaces” Friday, October 12, 2012, 10:00-11:00 p.m. ET(check local listings) In 1961, in the heady first days of the Cuban Revolution, Fidel Castro asked three visionary architects to build the Cuban National Arts Schools on what had been the golf course of a country club. Before construction was completed, the revolution became Sovietized, and suddenly the project was denounced as bourgeois and counter-revolutionary. These radical, magnificent buildings become a prism through which we see the turbulent, ever-shifting history of Castro’s Cuba and follow the fates of the three architects, now in their 80s, who may get a second chance to revitalize their utopian project. “Lemon” Friday, October 19, 2012, 10:00-11:00 p.m. ET(check local listings) When Lemon Andersen held a Tony Award in his hands for his work in Russell Simmons’ Def Poetry Jam on Broadway, it was close to a miracle. This poet/performer was a three-time felon who’d achieved more than anyone could have ever imagined. But when the show closed, he lost everything and moved his wife and two small daughters back to the projects. In desperation, he turned to the only thing he had left — his pen and his past. “Lemon” follows one man’s journey to take his life story to the New York stage while battling his darkest demons. HAVANA, HAVANA! – PBS ARTS (check local listings) Tap your toes to the beat of this music documentary that features expat Cuban musicians who return to Havana for a concert. INDEPENDENT LENS “The Longoria Affair”(check local listings) Learn how Private Felix Longoria’s burial helped launch the Mexican-American civil rights movement. INDEPENDENT LENS “Waste Land”(check local listings) See how artist Vik Muniz “paints” portraits of Brazilian catadores using garbage. JOHN LEGUIZAMO’S TALES FROM A GHETTO KLOWN – PBS ARTS(check local listings) Get a behind-the-scenes look at one of the industry’s most versatile actors: John Leguizamo. MARIACHI HIGH – PBS ARTS(check local listings) Spend a year in the life of the champion mariachi ensemble at Zapata High School in South Texas. NOT IN OUR TOWN: LIGHT IN THE DARKNESS(check local listings) Witness the efforts of villagers to confront anti-immigrant bias and repair the fabric of community life. POV “Biblioburro, The Donkey Library”(check local listings) Travel with a librarian who takes books, via two donkeys, to the children of a poor Colombian province. THE STORM THAT SWEPT MEXICO(check local listings) Explore the complex forces that shaped the Mexican Revolution and determined its consequences. PBS, with its nearly 360 member stations, offers all Americans the opportunity to explore new ideas and new worlds through television and online content. Each month, PBS reaches nearly 123 million people through television and more than 21 million people online, inviting them to experience the worlds of science, history, nature and public affairs; to hear diverse viewpoints; and to take front row seats to world-class drama and performances. PBS’ broad array of programs has been consistently honored by the industry’s most coveted award competitions. Teachers of children from pre-K through 12th grade turn to PBS for digital content and services that help bring classroom lessons to life. PBS’ premier children’s TV programming and its website, pbskids.org, are parents’ and teachers’ most trusted partners in inspiring and nurturing curiosity and love of learning in children. More information about PBS is available at www.pbs.org, one of the leading dot-org websites on the Internet, or by following PBS on Twitter, Facebook or through our apps for mobile devices. Specific program information and updates for press are available at pbs.org/pressroom or by following PBS Pressroom on Twitter.